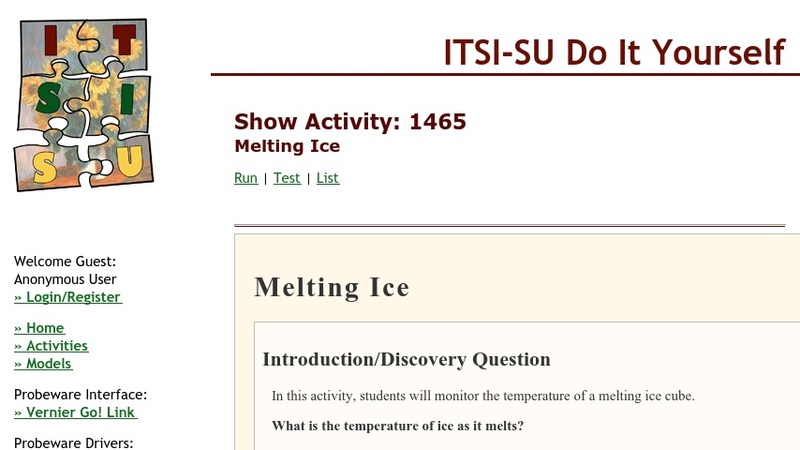 This activity combines a hands-on lab with a computer simulation, as students investigate and graph the changing temperature of a melting ice cube. In the first step, learners use a sensor to monitor temperature as ice melts in a cup of water. In the second step, the ice cube is melted in a cup of salt water. Interactive graphs allow easy plotting of Temperature vs. Time. The activity concludes with a simulation of the atomic structure of a hot liquid and a cold liquid. Click "Withdraw the Barrier" and watch the changing kinetic energy of the cold liquid particles as they mix with the hot liquid. This item is part of the Concord Consortium, a nonprofit research and development organization dedicated to transforming education through technology.